Humans love stories. They are a part of the way we think and feel and a powerful story can influence the way we behave and the choices we make. In retail sales, the shoppers who come into our stores are already involved in their own stories. Their story might be about making a birthday cake, painting a nursery, going off to college or learning to drive, but whatever it is, they’re looking for a happy ending. Supplying that ending, and using the techniques of storytelling in your store, can be a powerful sales technique. Since your store tells its own story. And it can’t help it – doing it whether you want it to or not. Think about the brand story you’re telling if your shelves are dusty, your staff distracted and your stock out of date. Take control of what your store says about your brand. It starts before your customer even comes through the door. The shop name and window display, and continues inside, through displays, routes through the shop, products and signage. Think of your store as a narrative with a beginning, middle and end. Apply this both to the physical reality of how a customer walks through your story, and the narrative of how they make buying decisions within the store. The window of the Cass Art shop featured above draws on a common customer story – wanting to enable a child’s creativity. The most successful independent retailers use theatre to sell their products. Retail theatre means making shopping a pleasurable experience that involves and engages the customer in the brand story. 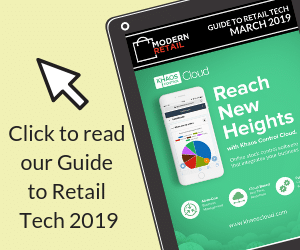 Demonstrations, chances to interact with products, visually arresting displays, in-store entertainment and events all create retail theatre, and make your bricks-and-mortar store an attractive alternative to online shopping. 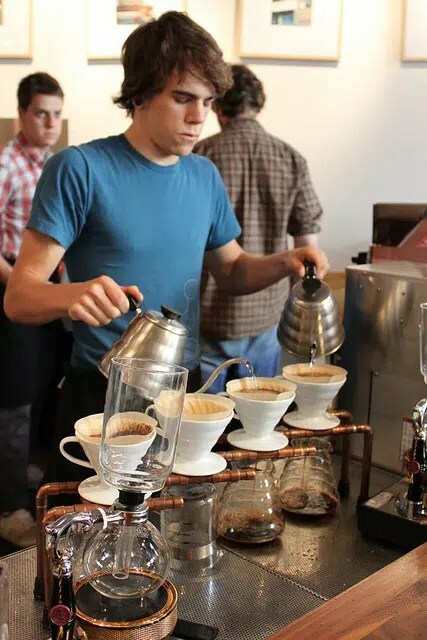 Intelligentsia coffee shops sell themselves on their coffee brewing expertise and they put this on display in-store with prominent ‘brew bars’ that show off their pour-over technique. Their retail sales staff become demonstrators for every customer. The story your customer walks through your door with probably starts with a problem. It’s the job of your retail sales staff to find out what that problem is, and to get to the heart of the plot by asking story-centred questions; open-ended, needs-orientated enquiries that expand the conversation. For example, in a kitchen, crafts or DIY store, instead of “what are you looking for today?”, you could ask “what are you making?” or “What project are you working on?” The response to the first question might just be “paint” – there’s no story there, only directions to the paint aisle. The response to the second question might be “I’m sprucing up our patio area.” This opens up the conversation into types of paint, other products for patio care, and that special offer you have on today on garden furniture. Your customer wants to be guided through your story. In the age of internet shopping, people are used to being informed about what they’re buying. Clear signage, guided selling and useful product information means your customer feels in control of the story as they move through the store. Consider signage placement and content in terms of the whole store experience. From the point of view of the customer’s story when they come through the door. 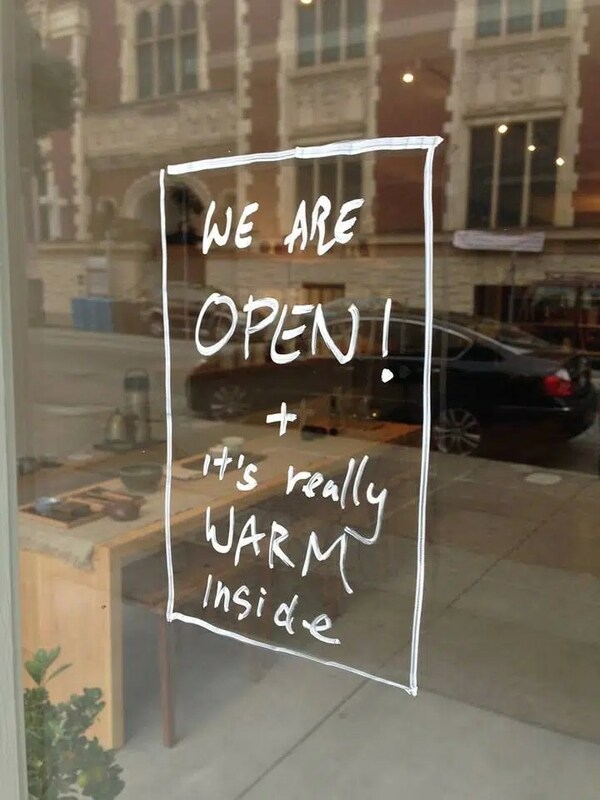 This simple sign in a café window shows an understanding of a very particular customer story. Your retail sales staff are your key storytellers. They should have the knowledge to ask the right questions, give the right information, and to do this they need to be engaged. Training on how to talk to customers, what to ask and how to give information will help staff become guides to your brand and products.